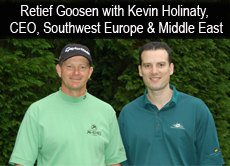 Southwest Greens is pleased to announce that Retief Goosen, former European Order of Merit winner and two-time US Open Champion has recently had a Southwest Green installed in his private residence in the UK. Southwest Greens is the undisputed global leader in the sales, design, installation and maintenance of synthetic golf solutions. With over 8,000 projects installed around the world since 1996, the Company has an unprecedented track record. Southwest Greens has a worldwide sales and installation presence that offers a variety of concepts for residential use, golf courses and the leisure industry – and it’s for these reasons that Nicklaus Design ®, one of the greatest names in golf, chose Southwest Greens to offer the world an exclusive line of synthetic golf greens. 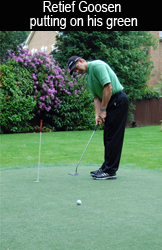 The decision to install a green in Mr. Goosen’s garden was made to allow him to practice his putting stroke and chipping under controlled conditions. 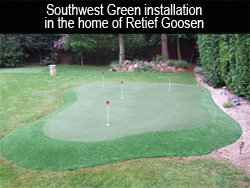 The installation process by which Southwest Greens adheres to has allowed them to create a product that satisfies even the most discerning of customers. For twelve years Southwest Greens has been delivering high quality solutions to its customers through their comprehensive installation techniques and master craftsmanship. With more than 30 PGA tour professionals as customers, including players such as Sergio Garcia, Jim Furyk, Vijay Singh, and Justin Rose, Southwest Greens has had the unique opportunity to receive feedback on their product from the world’s best players. This has resulted in Southwest Greens truly learning the subtleties existing in a tour quality golf green, allowing them to perfect the techniques necessary to effectively deliver these subtle qualities in their synthetic surfaces. “We have gone through a pain-staking process to arrive at the product we have today” says Kevin Holinaty, CEO, Southwest Greens Europe & Middle East “and we will continue to push the limits of our research and development capabilities to ensure we are always ahead of the quality curve in providing solutions for all of the product channels we focus on” says Mr. Holinaty. The green created for Mr. Goosen allows him to practice his putting and chipping with the trust that the ball will roll true on the surface at the speed he wants. This is an important point as it allows all Southwest Greens customers to truly practice the putting stroke, knowing that missed shots are just that – shots missed by the player rather than due to an inconsistent surface. “Southwest Greens were fantastic to work with both prior and during the installation. I was very impressed with their efficient and friendly staff and I can see why they take so much pride in the design and installation of their product. I am delighted with the finished green as it is a great surface to practice my putting in the comfort of my own home” says Retief Goosen.